SPECIALIZING IN COPPER, LEAD COATED COPPER, ZINC & PRE-PAINTED GALVANIZED GUTTERS, GUTTER COMPONENTS, AND ACCESSORIES. Slate And Copper Sales Co®. offers the most complete range of copper products. From our unique copper rain chains to our high quality copper gutters, we offer a wide selection of copper products that add elegance and class to your home. We also offer copper sheets and copper coil to manufacturers. With our original copper gutter system consisting of seamless downspout (downpipe) and gutter, heavy copper gutter hangers, and smooth seamless copper elbows, Slate And Copper Sales Co. has everything you'll need for your roof and beyond. The World Gutter System is the highest quality and most economical roof drainage system. With perfectly fitting pieces, the World Gutter System is also the easiest to install. (For a complete installation manual, click here) This copper rain gutter system offers not only exceptional strength and durability, but absolute beauty and design. All of our gutter components are also available in zinc- a beautiful, less costly alternative to copper. Browse our online catalog by selecting the product categories from the menu on the left, OR, to view product categories by photo, click on the "PRODUCTS" link above. Copper is a visually appealing metal with a unique character. It’s high resistance to corrosion and thermal conductivity, ease of fabrication, strength and resistance to fatigue are all reasons to select copper. Common uses of copper in the construction industry include flashing, roofing and gutters. Copper gutters and copper sheets are readily available, and the following are tips you can use to buy the best material for your construction projects. For copper gutters, look for products made from at least 16 ounces of cold rolled sheet copper. Cold rolling makes copper much stronger. A higher weight, such as 20 ounces, gives you a thicker wall, and it is a better choice if you live in a northern climate and anticipate ice and snow build-up or need long sections of gutter. Use appropriate fasteners, and select the shape and depth that works with your structure. Copper is also commonly used for roofing, flashing and other ornamental applications on a building due to its visual appeal and durability. The natural weathering process causes “Patina”, which protects the copper, lends itself to a color changing show from salmon pink and russet brown shades to light and dark chocolate browns. Eventually the color shifts to a dark bronze that ultimately develops copper's notable blue-green or gray-green patinas. Understanding this property is important in ornamental applications. When selecting copper sheets, keep the final product in mind. For intricate ornamental work, use lower gauge sheets that you can easily bend and shape. Copper cupolas are an excellent use of copper, and they provide a spectacular show through time with the natural weathering process. If you desire an Aged look, use a chemical “patina” solution on your copper gutters that will accelerate the color to its final stage, that beautiful bright or blue green weathered finish that normally takes 15 to 20 years to achieve. Select products that have a coating, such as oil, wax or paint, to keep the natural, weathered color that you want. You can easily find the perfect copper gutter and roofing materials on our website. Follow the tips above, and enjoy the finished building for years to come. Debit/Credit card payments subject to 3% surcharge. 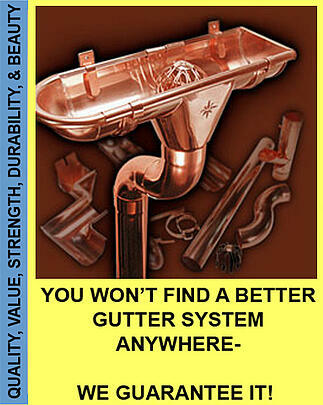 The World Gutter System is the best quality half-round copper rain gutter system available. 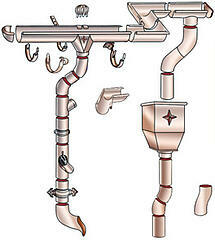 The World Gutter System’s gutter and downspout (downpipe) are made in 20 oz., 18 oz., and 16 oz. copper. Our gutter hangers are made from solid copper, 3/16” thick and 1” wide. They are the strongest copper hangers available. Our round downspout and elbows are seamless and flared on one end for a perfect fit. We offer rounded (spherical) end caps as well as flat. The World Gutter System offers not only exceptional strength and durability, but also absolute beauty in design. Our rain gutter profile is deeper. We use wider copper coil (girth) to fabricate our gutters. Our 4” half round gutter has as much copper as a standard 5” half round. Our 5” gutter has as much copper and moves as much water as a standard 6” half round gutter, and so on. 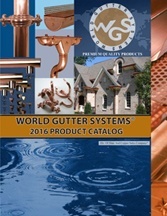 You get more copper with the World Gutter System!!! Our hangers are the strongest solid copper half round hangers in the world. We designed our hangers with a deeper structural rib that travels along the length of the hanger. This deeper rib results in our hangers being far stronger than any others on the market, as well as more attractive. Also, the holes for the mounting screws are recessed so that the top of the head of the screw sits flush with the hanger. The result is that a roof sits flatter upon our roof mount hanger and there is no pressure exerted by the screw against the gutter when using our fascia mount hanger. No other company has this feature. Our seamless elbows have an invisible and very strong weld where the edges are butted up against one another and are then precisely welded. Not only is the fit of our elbows the best in the industry, but our very popular 72 Degree elbow is uniquely designed so that the male end will fit tightly into a piece of “cut” downspout as well as fitting beautifully into the female end of a length of downspout or of another elbow. Our proprietary heavy-duty downspout brackets are the strongest and most versatile on the market. These also were designed by, produced for and are marketed solely by us.